It's Spring! It's Spring! The evenings are getting lighter, the days longer, and ok sure whatever the weather is not getting any warmer but that's just round the corner. I get more excited about wild garlic than I do about asparagus coming into season. Asparagus you can technically get all year round - and apparently you are a very bad person if you buy the Peruvian stuff (though no one seems bothered that we're clearing them out of avocados for our trendy brunches) - but wild garlic is just a very short season, from around March to June. The leafy greens grow in woodlands, and are easy to spot; a pointed leaf that smells strongly of garlic. Apparently. I just buy it from the vegetable stall that sets up in the farmer's market in Camberwell, because Camberwell does not have any woodland, and quite frankly I can't be arsed to go find any. I won't begrudge them the £1 for going to do the hard work for me. When cooked, wild garlic wilts like spinach does, so I tend to use it raw to flavour things, like I did with this noodle soup. Here, I've used it instead of the traditional garlic cloves to make a spicy, salty, sour nuoc cham sauce, that's Vietnamese in origin. It's really lovely, this - a light, delicate broth that's flavoured with lemongrass and chilli, and for good measure I also simmered the Dover sole carcass in there, after I was done with filleting it, for a little extra depth. You can use any greens you like; a couple stalks of purple sprouting broccoli and some sugar snap peas were my preference. You can use white fish fillets of any kind but you may need to source some fish stock for the richness (a simmered hake head would do nicely). It's really an assembly job, this. Divide the noodles into individual bowls and garnish with the blanched vegetables. Meanwhile, in a large frying pan with a lid, add around 400ml water with the lemongrass stick, roughly chopped up, one of the red chillis, roughly chopped, and the dover sole carcass (but not the skin). Bring to a boil, then simmer for 15 minutes with the lid on. Add the dover sole fillets, simmer for 3 more minutes, then remove the fillets and set to one side. Place the fillets into the noodle bowls evenly. 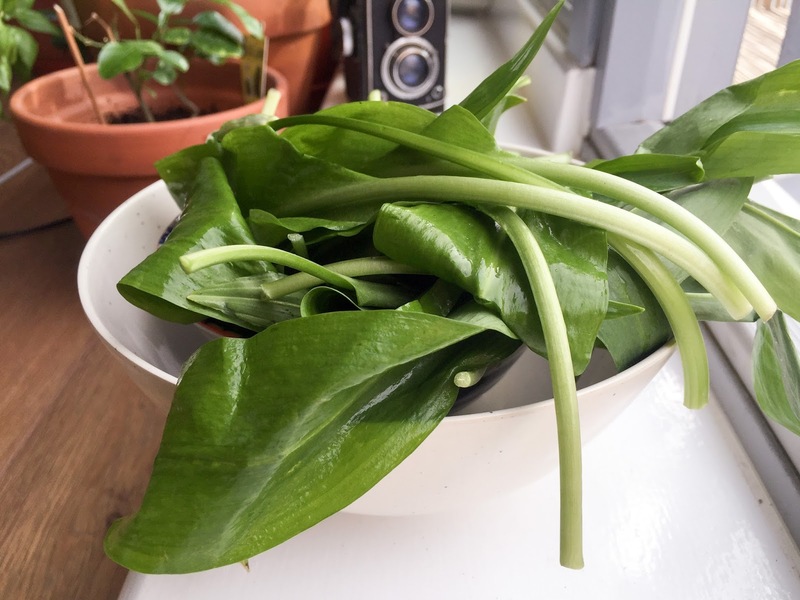 Mince the wild garlic by hand, and place in a bowl with the sugar, fish sauce and lime. Add the chopped chilli and mix well. Taste, and adjust if necessary. Strain the broth and bring to a hard boil, then pour evenly over the bowls of noodles. 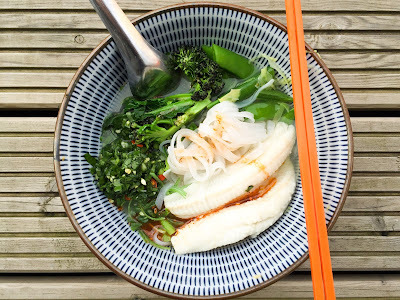 Plop a healthy tablespoon or two of the wild garlic nuoc cham on top, and drizzle with chilli oil if using. This looks gorgeous - really bright and fresh. I am so with you on the wild garlic - we don't all have a bloody garden or a woodland on the back doorstep!